Garmin’s Astro 430 and T5 Dog Tracking Bundle allows you to keep an eye on your hunting dog even when he’s out of view. Updating every 2.5 seconds, you can view your dog’s position up to 9 Miles away (T5), 4 Miles with T5 Mini on the sunlight viewable 2.6” Color Display. Track up to 20 Dogs on one device with additional T5/T5 Mini Collars. Preloaded 100K Topo Mapping and 1 year Birds-Eye Satellite Imagery Included. The next step in intuitive dog tracking systems, the Garmin Astro 430 brings pinpoint accuracy and preloaded detailed TOPO mapping. With a rugged housing that’s waterproof to IPX7 standards and a bright 2.6 inch color display, this Astro is ready to hit the trail and withstand any elements Mother Nature may throw your way. A faster 2.5 second location update with the ability to track up to 20 dogs at one time with a range of up to 9 miles with the T5 collar or up to 4 miles with the T5 mini collar, providing a visual trail of where your dogs have been and where they are relocating to next. Built in auto zoom feature gives you the capability to view all of the dogs being tracked on the display at one time, allowing you to easily see where you are and see what route your dogs are taking. Garmin introduces the Astro 430 with new and improved features, making it easier than ever for the end user to have expandability of mapping and access to useful information for navigation and tracking right in the palm of their hand. See data such as your dogs’ distance traveled, time out in the field, and more with Garmin’s Hunt Metrics feature. Providing such data allows you to help keep track of your dogs’ behaviors and tracking progress to optimize training capabilities. Capturing how many times your dog has been on point or treed gives you ample opportunity to record and store this information for training purposes or to share with friends through use of Garmin’s Basecamp and Garmin Adventures software. Your Garmin Astro 430 also has wireless connectivity to a compatible Garmin DriveTrack unit and the Garmin Fenix 3 GPS watch. If the preloaded 100K TOPO software doesn’t offer enough detail, or if you want to add additional mapping for driving or custom mapping, the built in SD card slot offers the ability to expand the horizon and give you the opportunity to use the Astro 430 for multiple uses. The built in 3-axis compass and barometric altimeter are just some of the added features that Garmin understands is a must have for any outdoorsman. Icons that are easy to read will show on the display to show your waypoints, your dogs, and your lodge or truck for a starting point. The Astro 430 is a great addition to any sporting dog activity you may be associated with and will offer you high quality features at a price that won’t break the bank. 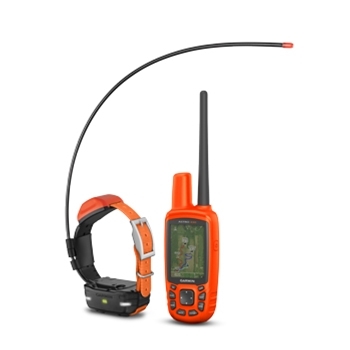 Each Garmin Astro 430 Dog Tracking GPS comes with: Garmin Astro 430 Dog Tracking GPS with Preloaded 100K Topo Maps, 1Year Birds-Eye Satellite Imagery Subscription, T5 Dog Device with rechargeable Li-Ion Battery pack, 1” Orange Collar Strap, (3/4” Orange Collar Strap for T5 Mini), Belt Clip, 5” Standard Antenna and 13” Extended-Range Antenna for Astro, 18.5” Standard Antenna and 22.5” Extended-Range Antenna for T5, (T5 Mini only includes 18.5” Antenna) AC Adapter, Vehicle Power Cable, Charge Clip for T5, USB Cable, Manual and a One-Year Warranty. Garmin Handlebar Mount and Cart Mount. 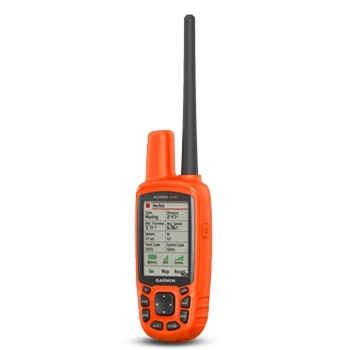 Compatible with Garmin Oregon, GPSMAP 62, GPSMAP 64,GPSMAP 66 eTrex 10/20/30, Astro 320, Dakota, Colorado, inReach and Rino Series of GPS units. Will mount right to a handlebar or rail. Garmin 12v lighter adapter for GPS 73, GPSMAP 62/64 Series, GPSMAP 78 Series, Oregon, Dakota, Delta, eTrex 10, eTrex 20, eTrex 30, Astro 320, Colorado, Approach and Montana/Monterra Series. Garmin Carabiner Clip for Most Handheld GPS Units. The Garmin Automotive Navigation Kit for includes a 12V lighter adapter, suction cup mount and an adhesive mount for the dash board. 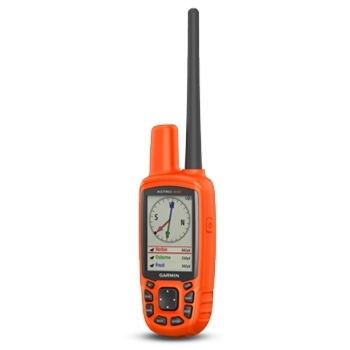 Compatible with Garmin GPSMAP 62, GPSMAP 64, eTrex 10/20/30, Astro 320, Oregon, Dakota, Colorado and Rino Series of GPS units. Garmin Marine Mount compatible with Garmin Rino series, GPSMAP 64/66, eTrex Series, Oregon, Colorado and Dakota series units as well as Astro series and Alpha 100. The Garmin Auto Friction Mount Kit comes with friction base, mounting arm and mounting bracket for your compatible handheld. Replacement/Spare battery for your Garmin TT10, TT15 or T5 tracking device. Can Not Ship via Air Service, Must Ship Ground Only! The Garmin T 5 Dog Tracking Collar offers a built-in high-sensitivity GPS receiver which tracks dogs up to 9 miles away when paired with the Astro 320 or Alpha 100. Built in LED Lighting works well in low light or night conditions and are visible up to 300 feet away. The Garmin T 5 Mini Dog Tracking Collar offers a built-in high-sensitivity GPS receiver which tracks dogs up to 4 miles away when paired with the Astro 320 or Alpha 100. Built in LED Lighting works well in low light or night conditions and are visible up to 300 feet away.